I feel like people love to talk about newborns and sleep. Which really is a funny thing given that newborns, well, don't sleep. They wake and eat and go back to sleep. Which actually isn't that bad. But what's not talked about and when people really need a shoulder to sleep, um, I mean cry on, is when their toddlers don't sleep. People expect toddlers to sleep. And I seem to hear so often from other moms that they just don't. Sure, they do enough to make you like them. Then, bam, they get sick, their schedule is messed up by a time change, you travel with them, and on and on and on. And then they don't sleep. And somehow this leaves one, well really ME, oh so much more exhausted than the newborn phase. Maybe it's because lately Callum wakes and will be up for an hour plus at a time...and this happens two times a night. But I also remember Isla going through this. I remember thinking I couldn't wait until she was old enough that she wouldn't cry out for me at night, but would just get up and come find me. That sort of feels like when I arrived in the sleep department. When I no longer had to get out of bed, but instead they came to me. But, the reality is we are a good year or more away from that happening with Callum. So I need to search deep down inside myself and learn to find the contentment in this broken sleep phase. Because we all know I will be crying when it's over...oh how motherhood has made me more emotional than I ever knew I could be! It doesn't help that my normally stellar napper has not had a proper nap in weeks due to our bathroom renovation. Something about power tools and workers stomping up our wooden stairs and right past his room make the nap situation difficult. Then both Callum and I end up grumpy over it all, making the night time situation that much more burdensome. You see what I did there? 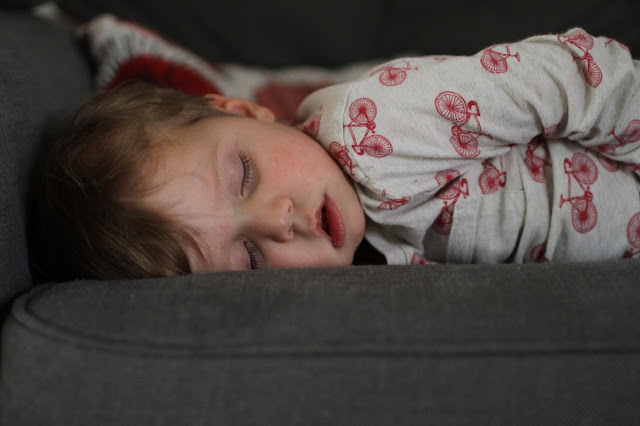 I managed to blame all my child's sleeping woes on our bathroom reno. That's kind of impressive, as I've also managed to blame it for my dirty house (hey, it's hard to stay out of their way and clean at the same time!) and lack of a social life (I'm afraid to leave and have them just leave my house unlocked when they go to lunch or leave for the day) on this project as well. But the end is in sight. I'm thinking two more weeks. So in two weeks I'll have a pretty bathroom that I can actually use again and nap time back! Those are some pretty big things to look forward to.